It has been very cold here this last week with highs below freezing. So I thought we would take advantage of the freezing temps to make some freezing art. I saw this idea last winter on Pinterest and thought the girls would enjoy it but last winter was so warm we had very few days below freezing. We did make a ice sculpture last winter, but it took a few days to freeze and defrosted pretty quickly. Our ice sculptures this year froze much quicker and have stuck around a while for us to play with. Both the ice sculptures have been a good lesson for the girls and I about freezing and what freezing conditions are really like. Both times the girls have loved checking on our sculptures in process to see if they have frozen or not. To make the balloon sculpture we took a package of regular party balloons we had and put a few drops of food coloring in each balloon. I then carefully filled the balloons in the sink and tied the ends. We put all the balloons on a tray and set them on our back porch over night. 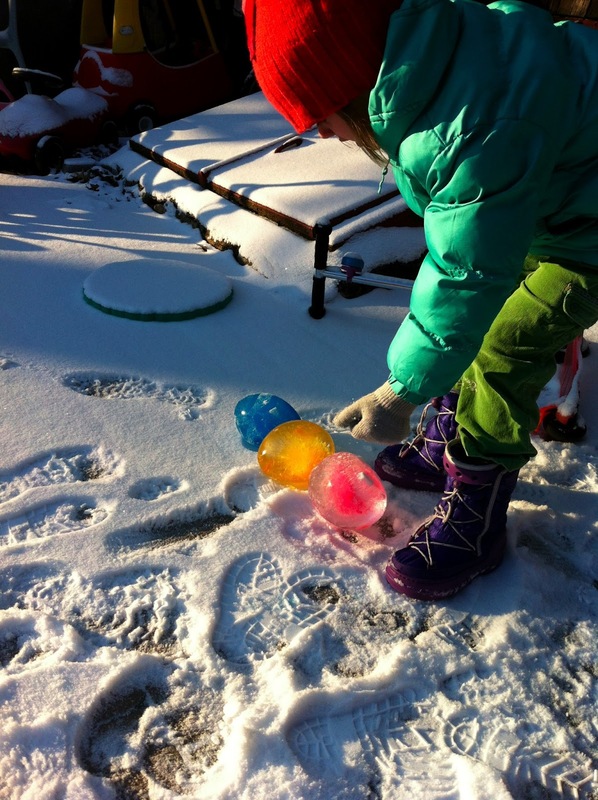 The next morning we had a light snow and the girls were delighted to find out balloons had frozen. We got on all our snow gear on and then went out to play. I carefully cut the balloons off and turned the sculptures over to the girls. They were so beautiful! it was neat to see how each one had frozen differently and all the cool patterns created in the ice. The girls liked seeing each one, stacking them up and carrying them around. We did have one drop and shatter but the other ones held up pretty well to a lot carrying and moving. We only made 5 this time, I think next time they are calling for snow we will try and make more and see what we can do with them. Beautiful! WE did this in the Summer....we'll have to try it in the Winter! Hi Melissa! So funny but it never occurred to me to do this in the summer. It never even occurred to me that I could put the balloons into the freezer. I am so glad you shared this because these will be so fun to do on a hot summers day! I have attempted this but can not ever figure out how to get the water in the balloon so that the balloon will expand. I've tried stretching them, blowing them up first, then deflating, differnt types of balloons..... so frustrating. Hi Carie! I had trouble at first but then found wrapping the open end of the balloon directly over the faucet, then turning on the water and holding the ballon on worked pretty well. I hope it works and if it does I would love to see your frozen balloons! These are amazing!! I grew up in Wisconsin and am trying to figure out why no one ever did this with me! I'm so excited to track down some balloons! This looks like a cool thing to do with the storm we are about to get!